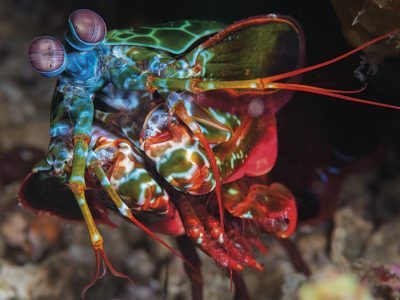 Mantis shrimps are not true shrimps, though they are both crustaceans. The difference is the taxonomic Orders to which they belong. They are accurately classified under Order Stomatopoda and are often simply called, mantis, because of their similar stance to the praying mantis (an insect), with its bulgy eyes and two folded claws or clubs. 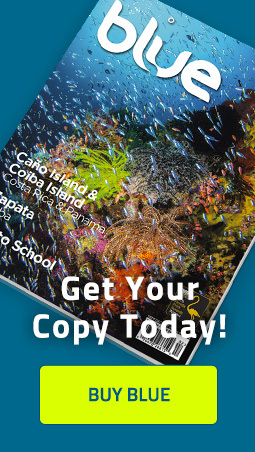 Stomatopods also have three pairs of walking legs, while shrimp (Order Decapoda) have five pairs. The Peacock Mantis (Odontodactylus scyllarus) , found in the Eastern Pacific, is referred to as a “smasher” when it comes to hunting prey. The two folded claws, clubs or raptorial appendages, are capable of a striking force that breaks the shells of other crustaceans as well as mollusks, to access the meal inside. With such powerful knock-out punches, scientists researched the shock-absorbing structure of the mantis’ clubs. Internally, it was discovered that there are parallel fibers of chitin, that also form a helix of stacked layers. The result—a highly effective lethal weapon that can shatter the shell of prey in a split-second, while the shock-absorbing design of these raptorial appendages, ensures that they not damaged after multiples strikes. Some other species of mantis are called “spearers” because of the way the raptorial appendages are used to grasp prey, instead of hitting with shell-shattering blows. Besides the extremely colorful appearance of the Peacock Mantis, its name is derived from the conspicuous and beautiful antennal scales that look like the feathers of a peacock. These structures are used in communication with other mantis shrimp, whether as mating signals or in territorial displays. 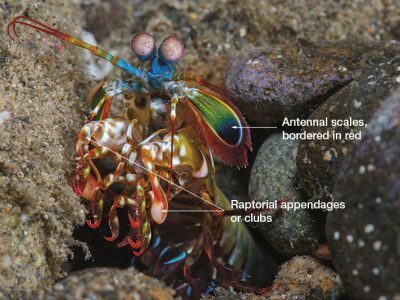 Regardless of its misnomer, mantis “shrimp” or mantis stomatopods are swift, burrowing creatures that are delightful to observe and even more exciting to photograph, if you’re patient enough.